This year’s Prize Winners event at Camberwell College of Arts preceded the Undergraduate and MA Conservation Summer Show’s Private View, setting up a cheerful mood for the evening. The event gave us the opportunity to say thank you to our generous prize givers, as well as celebrate the achievements of our prize winning students. The event was hosted by Camberwell’s Dean Nick Gorse. Throughout this week we’ll be posting the student prize winners. 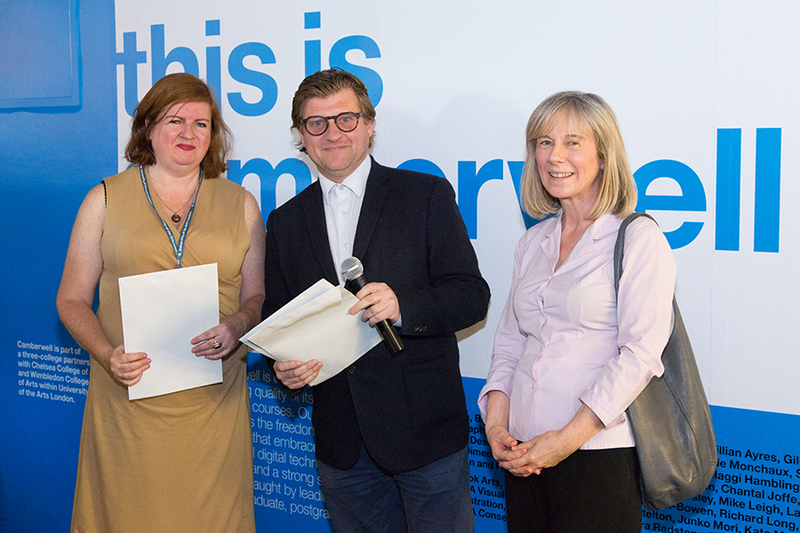 Congratulations to BA Painting graduate Fiona McAuliffe who was the winner of this year’s Harry Crisp Award. Fiona collected her award from Nick Gorse and Harry Crisp Award representative, Rosemary Hill. The Harry Crisp Award is given annually to graduating students at Camberwell. It is funded by the Camberwell Residential Fellowship Trust (CRAFT) which funds projects that bring together arts education and local communities in the Camberwell area. The prize is awarded to a graduating student who can demonstrate that they have worked with local community groups and individuals.